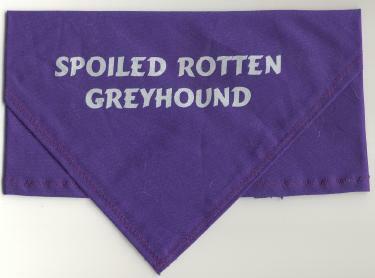 The well-dressed, pampered Greyhound can now stylishly admit to being SPOILED ROTTEN! Your best friend will look adorable in these adorable bandanas! Each banana makes the following statement: "Spoiled Rotten Greyhound". The material is a cotton, polyester mix and is fully washable. Colors may vary. Price is $7.00 for one bandana. Please click first button to order one. Please click second button to order two or more. For two or more bandanas, price is $6.00 apiece. Please email LonghouseJ@aol.com to order.